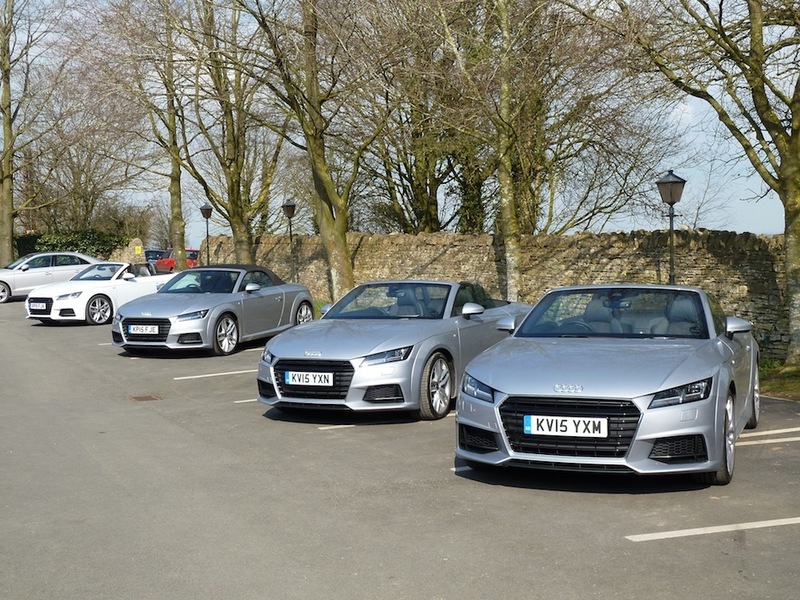 Audi’s line-up goes from strength to strength, and joining the range in the spring of 2015 were a new, third generation two seater TT Roadster (complementing the TT Coupé) plus a powerful TTS Coupé – representing the second generation of this model, priced from £31,955 to £37,555 (‘On The ‘Road’); in each case the prices are £2,185 more than equivalent fixed head coupé versions. 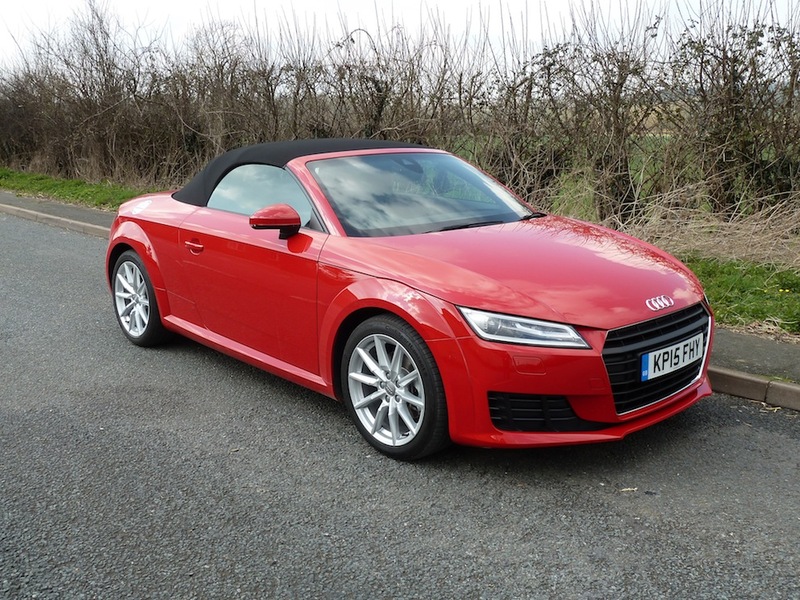 Audi is unique in offering both soft top and fixed head versions of their sports model in this sector (other manufacturers prefer to go for the folding steel roof option). It is interesting to note that the TT (first introduced in 1998) has been the top selling model in its market sector for the last decade. 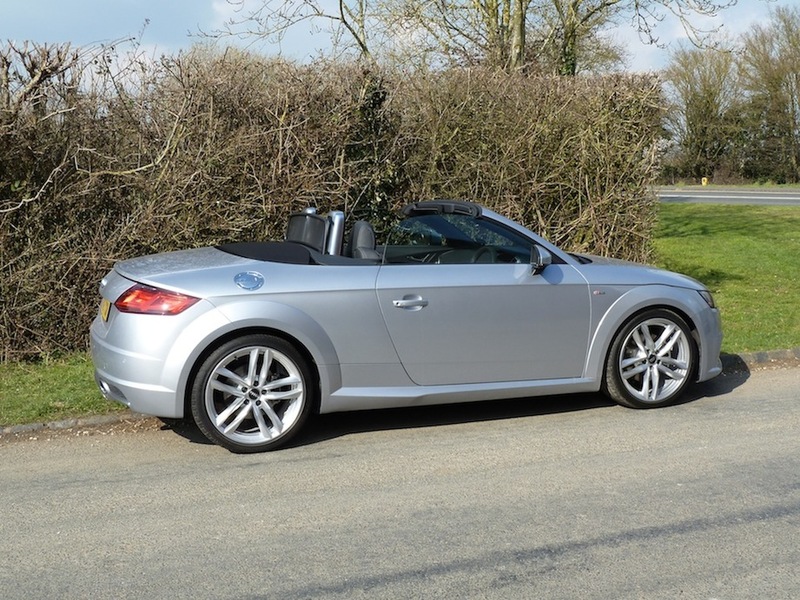 Although there are some styling similarities with the outgoing model, as with the Coupé version, the bodywork of the new TT Roadster is constructed from a mixture of aluminum and steel, to optimise vehicle weight, and hence aiding handling, performance and fuel consumption too. In ‘Audi speak’ the set-up is an ‘Audi Space Frame’ (ASF) system, based on the ‘Modular Transverse Matrix’ (MQB). The forward section of the car and the passenger compartment floor are made from ultra high-strength, hot-shaped steel, while other areas are of semi-finished aluminium. Providing the power is a choice of a 230 PS TFSI petrol motor, or a 184 PS 2.0 litre TDI turbo diesel unit, while TTS buyers benefit from a 310 PS version of the TFSI petrol engine. Helping to put the power down onto the tarmac in the TTS is the latest incarnation of Audi’s quattro all wheel drive system, and this can also optionally be specified in the 230 PS TFSI petrol variant. All other models feature front wheel drive. In all versions the innovative interior incorporates an all-digital ‘virtual’ cockpit. Audi has always opted to fit its convertible models with a fabric hood (rather than taking the ‘tin top’ route chosen by some other manufacturers), citing weight saving and aesthetics as the main reasons. The electrically-operated, acoustic hood incorporates three layers to provide effective thermal insulation and to minimise noise levels. In addition, the black inner headlining has a thick fleece layer, enhancing comfort. It is said that interior noise levels have been reduced by up to 6 dB by comparison with the outgoing TTR Roadster. Rear-end styling is easy on the eye. A discreet rear spoiler automatically deploys at high road speeds, to aid downforce on the rear wheels. The aerodynamic hood assembly (3kg lighter than in the previous TT Roadster) can be opened and closed at speeds of up to 31 mph, and in each case the procedure takes just 10 seconds. 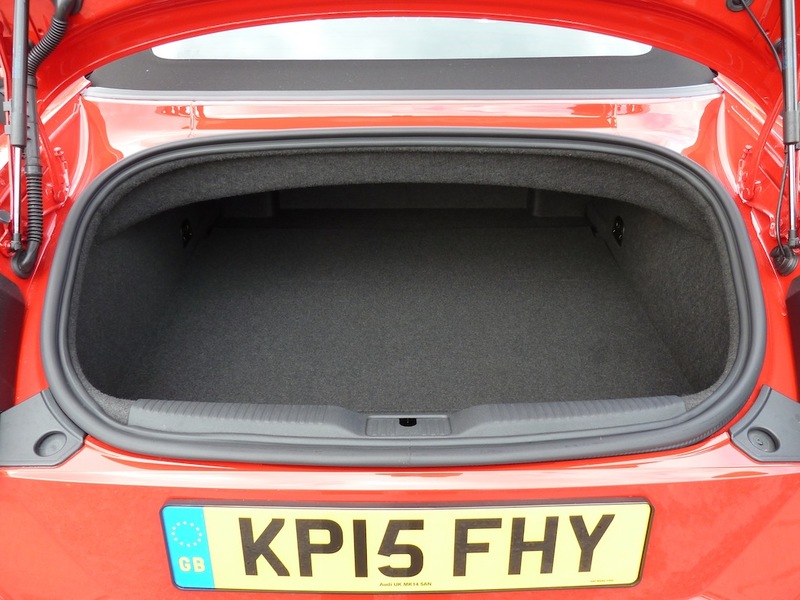 When the hood is in its ‘open’ position, it folds flat within an aluminium tray, and doesn’t reduce the boot’s 280 litre capacity. 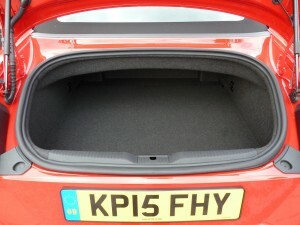 A practical feature is that the boot capacity is unaffected by the hood position; when open, the hood folds into its own tray above the luggage compartment. 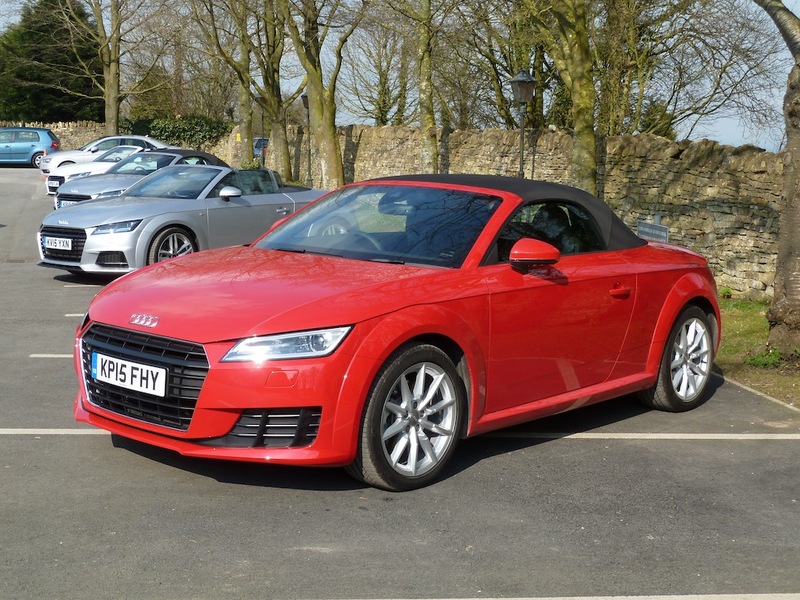 Initially two TT Roadster variants – Sport and S Line – will be offered to UK customers; there is also the 310 PS TTS Roadster. It is anticipated that 70 per cent of Roadster buyers will opt for the S-line, with 20 per cent preferring to buy the Sport, and the remaining 10 per cent going for the TTS Roadster. Both the TT Roadsters feature a ‘virtual’ cockpit, which employs a 12.3 inch, high resolution LCD display that fills the driver’s instrument binnacle (and replaces traditional instruments). Two selectable display modes are incorporated. In ‘classic’ view, the speedometer and tachometer are to the fore, whereas in ‘infotainment’ mode the virtual instruments are made smaller. 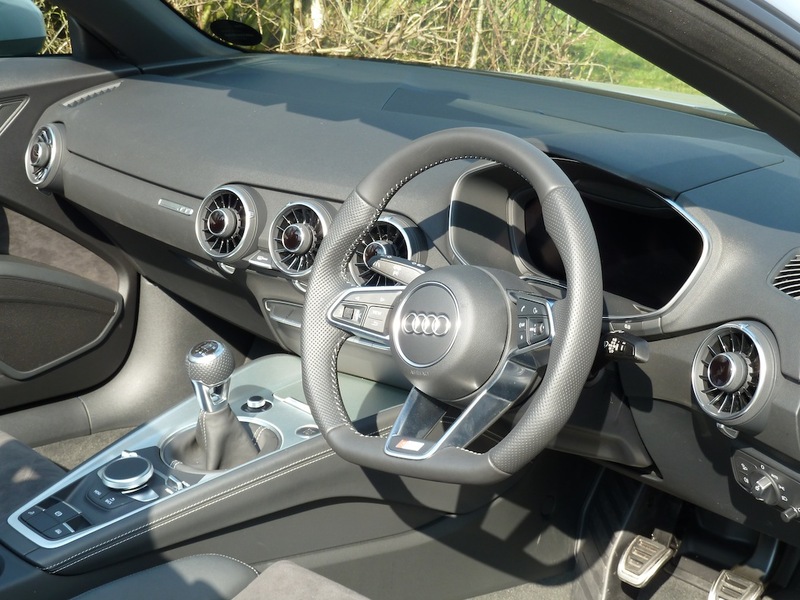 Sport versions feature Alcantara/leather-trimmed seats, manual air conditioning, Audi’s ‘Multi Media Interface’ (MMI) with a touch pad for fingertip data entry, Audi’s Music Interface and Bluetooth connectivity, keyless operation and Audi’s drive select’ adaptive driving system. This provides the driver with the opportunity to tailor the car’s dynamic qualities (including steering response) and driving characteristics (engine and transmission settings), according to requirements. Changes can be made instantly by switching between the five modes provided – Comfort, Auto, Dynamic, Efficiency and Individual. The system can also be used to vary operating parameters of optional systems, including Audi’s magnetic ride set-up (standard on the TTS Roadster; the system magnetically-charges particles to control shock absorber/damper response), and the S tronic transmission. 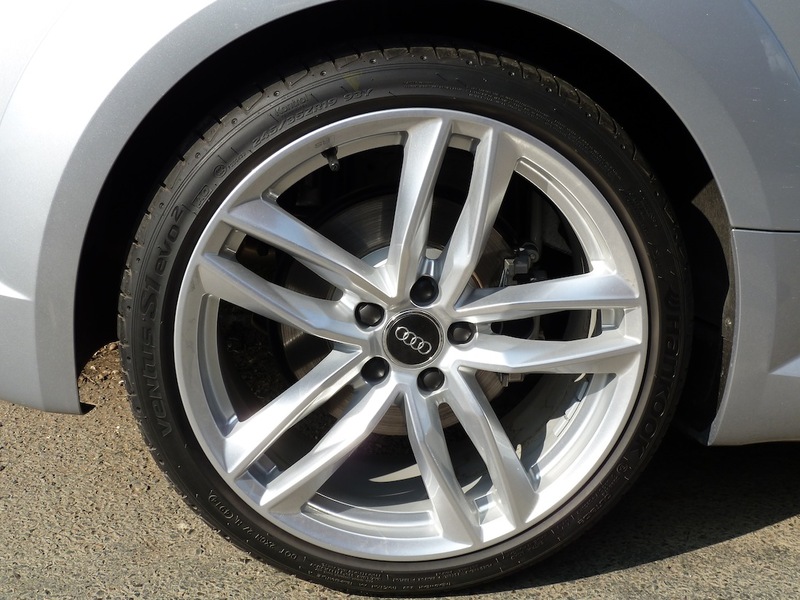 The Sport version, like this car, features attractive 18 inch aluminium alloy road wheels (the higher specification S line comes with 19 inch wheels as standard). Exterior features on the Sport versions include 18 inch, 10 spoke aluminium alloy wheels, sports suspension and xenon headlamps (with daytime running lights). The higher specification of the Roadster S Line includes 19 inch, five arm ‘star’ design wheels, all-weather LED head and tail lamps, rear indicators incorporating a directional ‘sweeping’ action, and a body styling kit. Optionally available is sport suspension (10mm lower), to provide better handling. On all versions is a rear spoiler that electrically extends from the boot lid at 74 mph, to give extra downforce on the rear wheels. The 2.0 litre TDI, which delivers 184 PS, and 380 Nm (280.3 lb.ft) of torque, plus up to 65.7 mpg and CO emissions of just 114 g/km – said to be a sector benchmark. The car is also capable of accelerating from standstill to 62 mph in 7.3 seconds (and the potential top speed is 147 mph). By contrast the 2.0 TFSI pushes out 230 PS, and 370Nm (272.9 lb.ft) of torque. The petrol engine in this model is mated either to a six speed manual gearbox, driving the front wheels, or a six speed S tronic twin clutch transmission (which can be controlled by steering wheel mounted paddles, if desired), in conjunction with quattro all wheel drive. When driving in ‘efficiency’ mode, the drive select system switches to ‘coasting’ when the driver releases pressure on the accelerator pedal. The quattro all wheel drive system has been redeveloped. In normal driving, the electro-hydraulic multi-plate clutch assembly distributes torque between the front and wheels, depending on driving style and conditions, and road characteristics. During more ‘enthusiastic’ cornering, more power is fed to the rear wheels. A clever, switchable ‘Electronic Stabilisation Control’ system (ESC) helps to distribute torque as required to help the driver to control the vehicle in all situations. For these seeking even more power, the TTS Roadster produces 310 PS and 380 Nm (280.3 lb.ft) of torque. 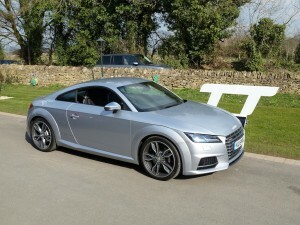 (For further technical details please also see the section of this report relating to the Audi TTS Coupé ). The TTS Roadster version accelerates to 62 mph from rest in just 4.9 seconds and has a top speed electronically limited to 155 mph. Audi’s drive select system enables drivers to control the sound of the exhaust note, using switchable flaps in the pipework. An innovative, speed-adaptive, progressive electro-mechanical steering system is fitted as standard to all the new Roadsters, and allows the steering to become more direct as the steering wheel is turned. 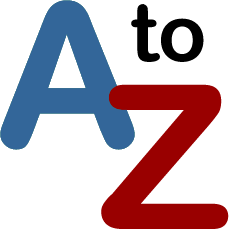 It is said to permit the car to be steered precisely with little movement of the steering wheel required. The system also aids operation of Audi’s active lane assist arrangement (standard on the Roadster 2.0 TFSI) and for the variety of parking assist options. Brake system revisions include the adoption of new, lightweight front calipers. An electro-mechanical handbrake is fitted to all versions. 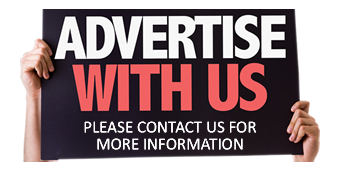 A wide range of options is offered to enable buyers to personalise their vehicles. These include the Technology Package (including HD-based navigation mapping and directly-beamed internet), side assist and active lane assist systems, traffic sign recognition, Matrix LED headlights with dynamic indicators, and an open-top driving package (including head-level seat heating, an electrically-activated wind deflector and heater ‘Super Sports’ seats; these can be temperature-controlled via the rotary dial in the air vents). The fixed head 310 PS TTS is a stylish package which provides power and performance a-plenty. The new TTS Coupé – with many technological aspects similar to those of the new TT Roadsters – is designed to deliver driving pleasure, being powered by a 310 PS version of the 2.0 litre TFSI engine. It delivers its considerable performance via a six speed transmission – either a manual gearbox or an S tronic transmission (the two versions are priced respectively at £38,790 and £40,270). The S tronic set-up incorporates two separate transmission structures, which are continuously active, but only one of which is connected to the engine at any one time. Ratio changes are accomplished by switching between two, radially-arranged multi-plate clutches, which activate the gears. Standard equipment levels are high, and include Audi’s magnetic ride system, a bespoke TTS set-up for the virtual cockpit, MMI touch, Audi’s Music Interface, drive select, and heated, leather-trimmed ‘super sports’ seats (plus other interior trim components) upholstered in fine ‘Nappa’ leather, plus Audi’s magnetic ride system and all LED head and tail lamps. Audi’s eight speaker, 155 Watt sound system and the firm’s ‘lane assist’ function also come as standard fittings. Peak engine power (310 PS) is delivered at between 5,800 and 6,200 rpm, and maximum torque (380 Nm or 280.3 lb.ft) all the way across the rev range from 1,800 to 5,700 rpm. The additional performance produced by this motor is helped by a larger turbocharger plus a high performance air-to-air intercooler, modified aluminium pistons, higher-strength connecting rods plus revised bearings, a reinforced crankcase, and a lightweight aluminium-silica cylinder head, incorporating uprated valve springs and valve seats. The result is spectacular performance; zero to 62 mph in just 4.6 seconds, on the way to an electronically limited top speed of 155 mph. The official ‘Combined’ fuel consumption figure is 41.5 mpg, and the CO2 emissions rating 157 g/km. The S tronic system includes a fuel-saving freewheeling function, activated when the drive select system is set to ‘Efficiency’ mode. 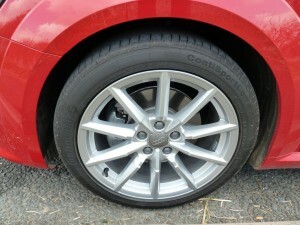 Audi’s latest version if its famous quattro all wheel drive system comes as standard with this model. For the first time the quattro set-up is controllable via Audi’s drive select system. The various transmission components are positioned within the ‘chassis’ to optimise weight distribution and thus enhance the car’s dynamic behaviour. The Electronic Stability Control (ESC) system incudes and electronic limited slip differential. Further measures to aid handling and roadholding include the adoption of lowered sports suspension and the incorporation of lightweight components within the suspension set-up (MacPherson struts at the front, with a four-link arrangement at the rear). Audis’ magnetic ride damper control system is also standard. Immediately recognisable as a TT, Audi’s sharply-styled latest version incorporates completely new aluminium/steel bodywork architecture. 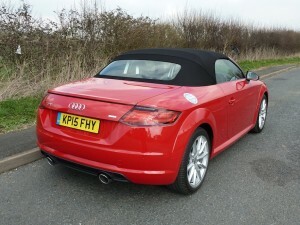 I first sampled a 2.0 TDI ultra diesel version of the new TT Roadster, producing 184 PS. During a three hour drive, taking in roads from winding country lanes to motorways, I found the test car quiet-running, refined and fun to drive, with prodigious amounts of power and torque on tap, and the six speed manual gearbox in the text vehicle was both slick-changing and easy to use. The delivery of maximum torque from low engine speeds, and across a wide rev range, means that the car will always pull strongly and driving in town was relatively effortless, with minimal gearchanging required. Handling and roadholding characteristics were impressive too, and the ride quality was commendable, complementing the comfortable seats. The electrically-activated hood worked well, and I tried opening and closing the hood ‘on the move’; the job was done effectively and instantly, and was accomplished in just a few seconds. Even with the hood down, the car felt solid and there was no evidence of ‘scuttle shake’. With the hood closed (and it fitted impeccably) the vehicle was warm and felt as solid as any fixed head car that I’ve driven. High speed cruising requires very few engine revs (good for refinement and low noise levels, as well as fuel consumption); at 70 mph in top (sixth) gear, the tachometer needle was indicating just 1,900 rpm. I felt that the ‘Virtual Cockpit’ instrument system was very clear and easy to use, and the satellite navigation map was an example of its type too. Having said that, my driving colleague and I both found it frustratingly difficult to activate the navigation system, having keyed in a destination. Perhaps this aspect would improve with familiarity, but we both felt that a more intuitive method of ‘telling’ the system to start route guidance would have been helpful. During my test drive the overall fuel consumption, as indicated by the car’s computer, was 53.2 mpg. Side view of the Roadster with the hood down is uncompromisingly uncluttered. Note the roll-over protection provided behind the seats. This is the 2.0 TFSI S-line. The next Roadster I drove was more powerful (230 PS) and petrol-powered; it was also in the better-equipped S line form. This car too was smooth, hushed at speed and felt solid and safe in all situations. It was slightly lower-geared than the 184 PS diesel, with 70 mph in top (sixth) gear resulting in a rev reading of 2,300 rpm, but the car was delightfully quiet and refined at all speeds. As with the 184 PS turbo diesel, it was enjoyable to drive – and ultimately a little faster. Switching the drive select system from ‘Auto’ to ‘Dynamic’ mode provided a tauter, more sporty feel to the vehicle, with improved ‘chassis’ responses as well as more ‘urgent’ performance levels. Modern dash design within a comfortable two seater cockpit. This car has a six speed manual gearbox. Note the ‘drive select’ rotatable control behind the gear lever. This test car was fitted with optional ‘S twin spoke’ 19 inch sports wheels (costing £450 more than the standard-fit 19 inch wheels). My last drive of the day was in the new fixed head TTS. 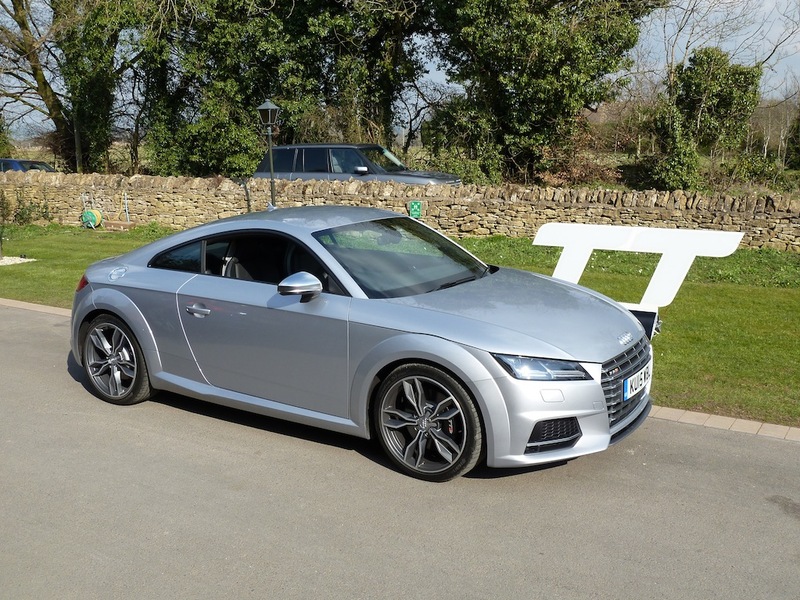 With 310 PS under the bonnet, this is a true driver’s car, and it offers rapid but safe progress for those seeking even greater performance than the ‘normal’ TT models. I was especially impressed by the car’s ultra-rapid acceleration, both from rest and on the move, and by its dynamic responses when motoring ‘enthusiastically’. With the drive select control set to its ‘Dynamic’ position, the ride quality became firmer but the car’s steering responses and overall feel sharpened up considerably. During fast motoring on open, twisting roads it was predictable in the way it behaved, and felt safe; the brakes were reassuringly powerful too. The new TT models are impressive in so many ways. In particular they feel safe, solid and well-engineered, incorporating a totally revised form of body construction which enhances emissions and fuel consumption, as well as aiding handling. I liked the Virtual Cockpit set-up too, and I thought that in most respects it was very intuitive for those new to the display system. Crucially, the new TT models remain fun to drive – and personally I feel that the latest styling changes make the latest versions the most attractive of all the TT generations to date. ‘On the road’ price (not including options): £31,310 (as sampled, with options: £37,795). ‘On the road’ price (not including options): £33,820 (as sampled, with options: £40,255). ‘On the road’ price (not including options): £37,965 (as sampled, with options: £42,615).